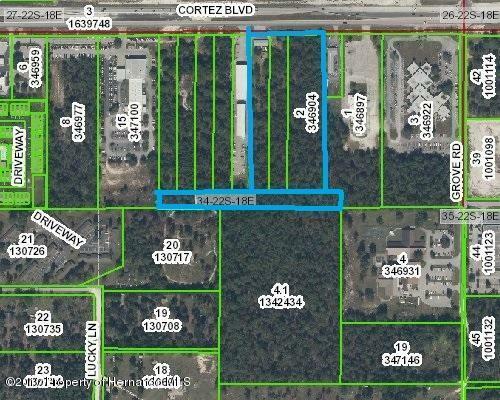 Mixed use with 10 acres plus /minus commercial.Very close to Suncoast Pkwy (1/4 mile +-) , 400 foot fronting on SR southerly 24 acres is also available to the south for additional commercial, OP and Multi Family, some of the property will need to be re-zoned. Brookridge 55+ mobile home community with 2440 units is located across the street. Current traffic count, approximately 35,000 cars daily.Being sold subject to obtaining site plan approval and final plat. Hernando County is moving all administration offices and constitutional officers into office complex just 300 feet east of the subject property. This area will need offices and restaurants to service government employees.